For other uses, see Cavalier (disambiguation). Prince Rupert of the Rhine, often considered to be an archetypal Cavalier. Cavalier (/ˌkævəˈlɪər/) was first used by Roundheads as a term of abuse for the wealthier Royalist supporters of King Charles I and his son Charles II of England during the English Civil War, the Interregnum, and the Restoration (1642 – c. 1679). It was later adopted by the Royalists themselves. Although it referred originally to political and social attitudes and behaviour, of which clothing was a very small part, it has subsequently become strongly identified with the fashionable clothing of the court at the time. Prince Rupert, commander of much of Charles I's cavalry, is often considered to be an archetypal Cavalier. Cavalier derives from the same Latin root as the French word chevalier (as well as the Spanish word caballero), the Vulgar Latin word caballarius, meaning "horseman". Shakespeare used the word cavaleros to describe an overbearing swashbuckler or swaggering gallant in Henry IV, Part 2, in which Shallow says "I'll drink to Master Bardolph, and to all the cavaleros about London". An engraving depicting Charles I and his adherents. 1642 (June 10) Propositions of Parlt. in Clarendon v. (1702) I. 504 Several sorts of malignant Men, who were about the King; some whereof, under the name of Cavaliers, without having respect to the Laws of the Land, or any fear either of God or Man, were ready to commit all manner of Outrage and Violence. 1642 Petition Lords & Com. 17 June in Rushw. Coll. III. (1721) I. 631 That your Majesty..would please to dismiss your extraordinary Guards, and the Cavaliers and others of that Quality, who seem to have little Interest or Affection to the publick Good, their Language and Behaviour speaking nothing but Division and War. Charles, in the Answer to the Petition 13 June 1642 speaks of Cavaliers as a "word by what mistake soever it seemes much in disfavour". It was soon reappropriated (as a title of honour) by the king's party, who in return applied Roundhead to their opponents, and at the Restoration the court party preserved the name, which survived until the rise of the term Tory. Cavalier was not understood at the time as primarily a term describing a style of dress, but a whole political and social attitude. However, in modern times the word has become more particularly associated with the court fashions of the period, which included long flowing hair in ringlets, brightly coloured clothing with elaborate trimmings and lace collars and cuffs, and plumed hats. This contrasted with the dress of at least the most extreme Roundhead supporters of Parliament, with their preference for shorter hair and plainer dress, although neither side conformed to the stereotypical images entirely. 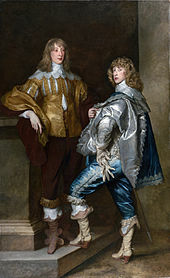 Lord John Stewart, c. 1638 (left), pictured with his younger brother Lord Bernard Stewart (1623–1645), by Sir Anthony van Dyck. Most Parliamentarian generals wore their hair at much the same length as their Royalist counterparts, though Cromwell was something of an exception. The best patrons in the nobility of Charles I's court painter Sir Anthony van Dyck, the archetypal recorder of the Cavalier image, all took the Parliamentary side in the Civil War. Probably the most famous image identified as of a "cavalier", Frans Hals' Laughing Cavalier, shows a gentleman from the strongly Calvinist Dutch town of Haarlem, and is dated 1624. These derogatory terms (for at the time they were so intended) also showed what the typical Parliamentarian thought of the Royalist side – capricious men who cared more for vanity than the nation at large. The chaplain to King Charles I, Edward Simmons described a Cavalier as "a Child of Honour, a Gentleman well borne and bred, that loves his king for conscience sake, of a clearer countenance, and bolder look than other men, because of a more loyal Heart". There were many men in the Royalist armies who fit this description since most of the Royalist field officers were typically in their early thirties, married with rural estates which had to be managed. Although they did not share the same outlook on how to worship God as the English Independents of the New Model Army, God was often central to their lives. 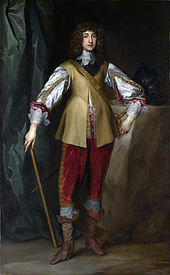 This type of Cavalier was personified by Jacob Astley, 1st Baron Astley of Reading, whose prayer at the start of the Battle of Edgehill has become famous "O Lord, Thou knowest how busy I must be this day. If I forget Thee, do not forget me". At the end of the First Civil War Astley gave his word that he would not take up arms again against Parliament and having given his word he felt duty bound to refuse to help the Royalist cause in the Second Civil War. [He] would, without hesitation, have broken any trust, or done any act of treachery to have satisfied an ordinary passion or appetite; and in truth wanted nothing but industry (for he had wit, and courage, and understanding and ambition, uncontrolled by any fear of God or man) to have been as eminent and successful in the highest attempt of wickedness as any man in the age he lived in or before. Of all his qualifications dissimulation was his masterpiece; in which he so much excelled, that men were not ordinarily ashamed, or out of countenance, with being deceived but twice by him". This sense has developed into the modern English use of "cavalier" to describe a recklessly nonchalant attitude, although still with a suggestion of stylishness. Cavalier remained in use as a description for members of the party that supported the monarchy up until the Exclusion Crisis of 1678–1681 when the term was superseded by "Tory" which was another term initially with pejorative connotations. Likewise, during Exclusion Bill crisis the term Roundhead was replaced with "Whig", a term introduced by the opponents of the Whigs and also was initially a pejorative term. An example of the Cavalier style can be seen in the painting "Charles I, King of England, from Three Angles" by Anthony van Dyck. ^ Manganiello 2004, p. 476. ^ a b OED 1989, "Cavalier". ^ a b Chisholm 1911, p. 562. ^ OED 1989, "Cavalier", Meaning 4. attrib., First quotation "1666 EVELYN Dairy 13 Sept., The Queene was now in her cavalier riding habite, hat and feather, and horseman's coate". ^ Carlton 2002, p. 52. ^ Woolrych 2002, p. 249. ^ Hume 1841, p. 216 See footnote r. cites Warwick 229. ^ Barratt 2005, p. 177. ^ Clarendon 1839, p. 3. ^ Chisholm 1911a, p. 259. Barratt, John (2005). Cavalier Generals: King Charles I and His Commanders in the English Civil War, 1642–46. Pen & Sword Military. Carlton, Charles (2002). Going to the Wars: The Experience of the British Civil Wars 1638-1651. Taylor & Francis. p. 52. ISBN 978-0-203-42558-9. Chisholm, Hugh, ed. (1911a). "Goring, George Goring, Lord" . Encyclopædia Britannica. 12 (11th ed.). Cambridge University Press. pp. 258–259. Clarendon, Edward Hyde, 1st earl of (1839). The history of the rebellion and civil wars in England. 5 (seven volumes ed.). Oxford University Press. p. 3. Hume, David (1841). The History of England from the Invasion of Julius Caesar to the Revolution 1688. V. .T. Cadell. Manganiello, Stephen C. (2004). The Concise Encyclopedia of the Revolutions and Wars of England, Scotland, and Ireland, 1639-1660. Scarecrow Press. p. 476. ISBN 978-0-8108-5100-9. Memegalos, Florene S. (2007). George Goring (1608–1657): Caroline Courtier and Royalist General. Ashgate Publishing. ISBN 0-7546-5299-8. OED (1989). "Cavalier". Oxford English Dictionary (Second ed.). Woolrych, Austin (2002). Britain in Revolution : 1625-1660: 1625-1660. Oxford University Press. p. 249. ISBN 9780191542008. Worden, Blair (2009). The English Civil Wars 1640–1660. London: Penguin Books. ISBN 0-14-100694-3. This article incorporates text from a publication now in the public domain: Chisholm, Hugh, ed. (1911). "Cavalier" . Encyclopædia Britannica. 5 (11th ed.). Cambridge University Press. pp. 562–563. Look up cavalier in Wiktionary, the free dictionary. Stoyle, Mark. "Choosing Sides in the English Civil War". BBC. Retrieved 16 September 2008.